Research about the issue of homelessness largely has focused on understanding the characteristics and addressing the needs of homeless adults and families in our communities. Much less research has been conducted to document the characteristics and needs of homeless youth. In recent years, a number of studies have come out in Illinois that address the situation of homeless adults and families as well as youth. Yet there remains a lack of data documenting the perspective of homeless youth concerning their own needs. Providing services that youth report they need can serve as a gateway to other needed services. In the summer of 2003, the Chicago Department of Health sponsored a symposium on the needs of LGBTQ homeless youth. Discussions during this meeting made it clear that assessing the needs of homeless youth would require looking beyond those who were living in shelters, and that the needs of subgroups within the homeless youth population were likely to vary considerably. In response to this need for more information about homeless youths' needs, the City's Department of Children and Youth Services (CYS) partnered with the Night Ministry, an agency with a history of addressing the needs of marginalized youth, to commission the Center for Impact Research (CIR) to conduct a study of the needs of homeless youth in the City of Chicago. 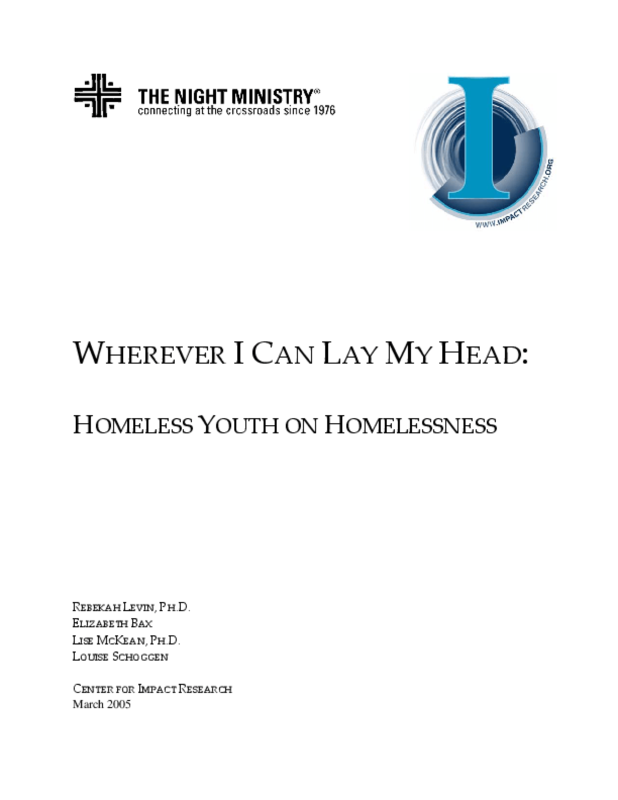 The purpose of this study was to learn what the youth themselves identify as their needs, and to understand the differences in these needs among a variety of subgroups-those experiencing their first episode of homelessness, those cycling in and out of homelessness, and those experiencing chronic homelessness. Both the non -profit service providers and the City hope that identifying and meeting these needs not only will act as a gateway to other needed services, but also will expedite resolution of problems that result in homelessness and lead to the establishment of permanent, stable, and safe living situations. With guidance from the Homeless Youth Task Group of the Chicago Continuum of Care 3 and an advisory group composed of government policy makers and program personnel and non-profit agency directors,4 CIR conducted a survey of homeless youth in Chicago between the ages of 14 and 21 during April and May 2004. Twelve youth, nine of whom were homeless, were recruited and trained to interview homeless youth for the project. They conducted 400 interviews with homeless youth throughout Chicago -- at bus stops, fairs and festivals, on trains, streets, and basketball courts, in parks, shelters, schools, homes, drop -in centers, churches, and restaurants. In addition to conducting the survey, CIR interviewed homeless youth service providers, advocates, and public policy personnel working at public and private agencies. These interviews provide further information about the needs of homeless youth and the resources currently available to them, as well as ways that the various systems serving homeless youth might be improved.